Homemade Alfredo Sauce - just like Olive Garden's but homemade! 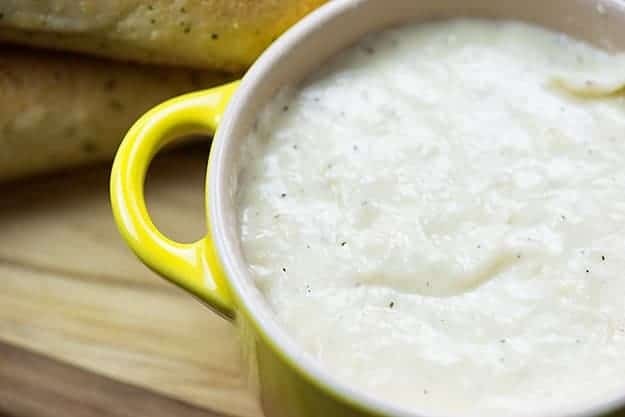 If you love the Olive Garden Alfredo sauce, you’re going to need to learn my secrets for how to make homemade alfredo sauce. It’s even better than the restaurant and unbelievably easy! I was an adult the first time I ever had chicken Alfredo, which is really sad because that means I missed out on years of this creamy cheese sauce coating my pasta. I’ll never forget the first time I tried it. I was at Olive Garden with some friends and they ordered a side of Alfredo for dipping their breadsticks in. I was so hesitant to try it, but once I did, I was hooked. 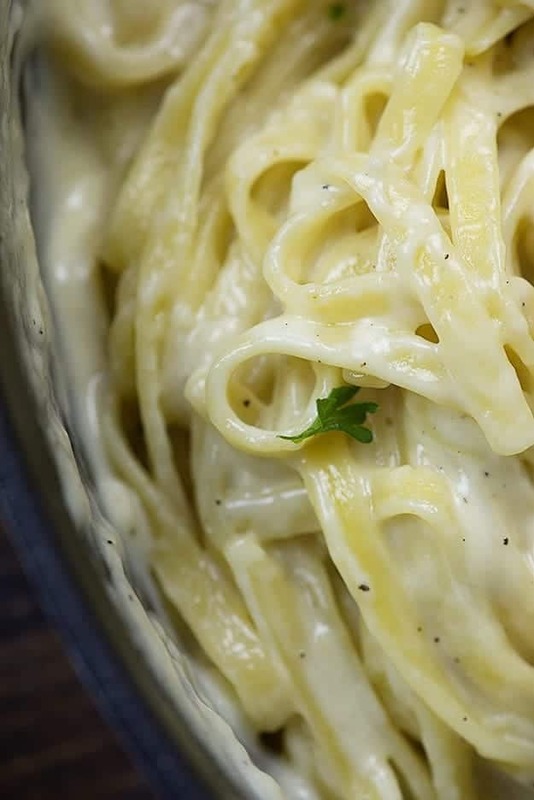 Homemade Alfredo sauce tastes like creamy, cheesy heaven. How could anyone not like this rich, flavorful sauce? It wasn’t long after I first tried it that I googled how to make Alfredo sauce at home. Y’all. The recipe that I stumbled on was a nightmare of ingredients. Flour and cream cheese and a whole bunch of other garbage that just does not belong in authentic Alfredo sauce. 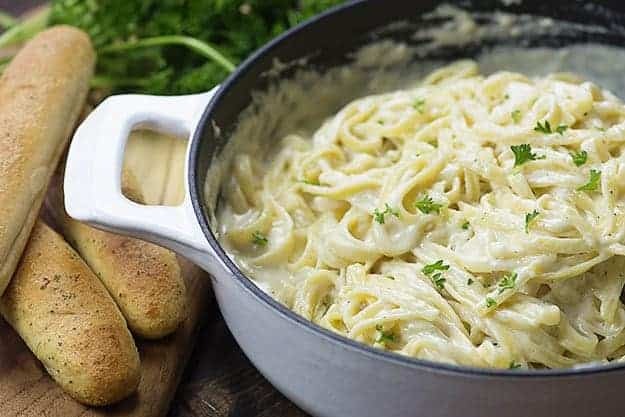 This recipe for Alfredo sauce has just a few ingredients – nothing weird or strange or hard to find. 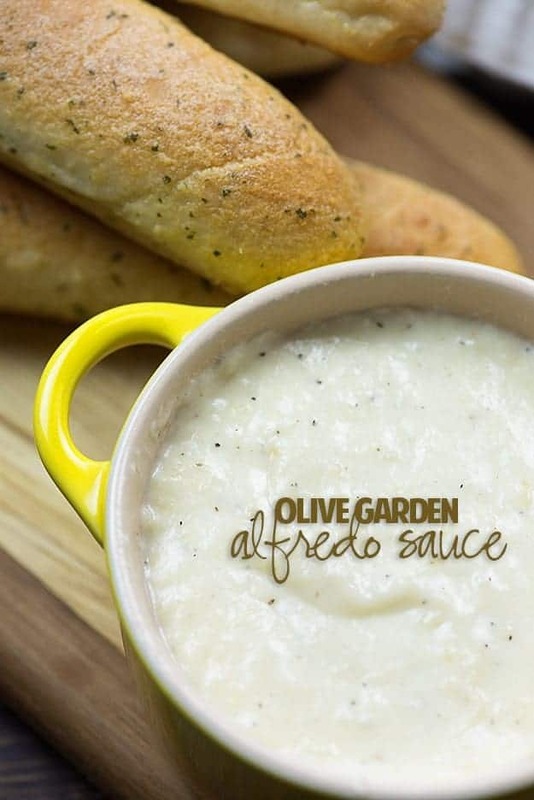 Aflredo sauce is made of just heavy cream, butter, and grated Parmesan cheese. You’ll just melt the butter and cream together, remove from the heat, and stir in the Parmesan cheese until it’s thick and creamy. You can stir in any additional seasonings you’d like. Nutmeg is nice. Salt is necessary. Black or white pepper is a must. I do a garlic Alfredo sauce by adding in a teaspoon of minced garlic to the butter and cream while it’s heating. The garlic flavor is perfect with this creamy sauce! This is a gluten free alfredo sauce, because flour does not belong here. It’s unnecessary. But how do you thicken your alfredo sauce without flour, you ask? Cheese, y’all. Just cheese. I find this recipe to be perfectly thick on it’s own, but you’re welcome to stir in more Parmesan cheese if you’d prefer a thicker sauce. And, since this is flour-free, that makes this a keto Alfredo sauce, which is happy news for those of you following a low carb diet! 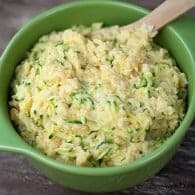 This easy alfredo sauce makes enough for one pound of pasta, if you like your pasta heavily dressed. We usually reserve a bit for dipping our breadsticks in or for drizzling over chicken. Unfortunately, Alfredo sauce really doesn’t reheat very well. It tends to separate and get a bit oily. Luckily, it’s a totally simple recipe to make and only takes a couple of minutes. If you make this homemade Alfredo sauce, snap a pic and share it with me! Tag the picture #bunsinmyoven on Instagram so I’m sure to see it, or share it in my Facebook group! Add the cream and butter to a sauce pan over medium heat and bring to a simmer. Whisk in the garlic and simmer for 30 seconds. Turn off the heat and whisk in the Parmesan cheese, salt, and pepper. Continue whisking until cheese has fully melted and sauce is smooth and creamy. This sauce makes enough to generously coat 1 pound of pasta. Do not use the powdery Parmesan cheese in this recipe. Looks great. I will try it this weekend. The kids will probably love it. This looks amazingly yummy. Thanks for sharing. Yum! Is it wrong that I just want to drink this? I love homemade sauces! Well for gosh sakes. 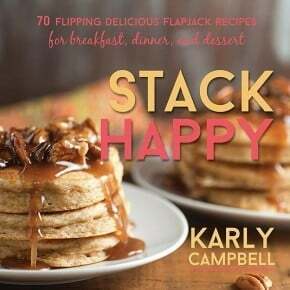 I’m over there at Foodgawker, submitting a pic, and this flipping’ pic catches my eye… then I looked at the name below it, “Karly” – I was like “shoulda guess man, I shoulda guessed.’ — This looks absolutely phenomenal, I’m pretty speechless, and that doesn’t happen easily. Well done my friend…. well done. I have never had Alfredo. I’m 60, why start now? I saw this video on Facebook and it looked delicious. I have a question though – in the video it is obviously a whole stick of butter that is used. In the recipe, however, it calls for 1/2 stick. Camera angles? or did you possibly double the recipe in the video? oops – my error! I’m confusing my measurements! Sorry! The recipe calls for 1/2 cup which is 1 stick of butter. Make this all the time and it is delish! Usually 1 stick of butter is equal to 1/2 cup of butter. There are sticks of butter that equal 1 cup of butter but they are usually much bigger looking. You can use either freshly grated Parmesan or a bag of shredded Parmesan, but definitely don’t use the powdery kind in the green can. Because it’s not meant for melting. It’s a garnish, not really something you cook with. Home made Alfredo is the best! Looks amazing. This sounds wonderful, but how can it be Keto friendly with 13 carbs per serving? Or am I reading it wrong? Lol yeah as Karly said its calculating for the whole recipe not the individual serving. Otherwise it would be absolutely horrible for you at 171 grams of fat and 104 grams of saturated fat XD. Plus 13 grams of carbs isnt actually that bad. 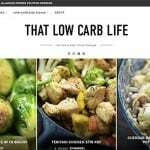 Low carb diets call for between 50 and 150 carbs so unless you are eating several servings youre still in a targeted range for carbs each meal. Olive Garden’s alfredo sauce is not gluten free. They add flour to theirs. Delicious! I read in one of your replies to a comment about not using grated parm in the plastic shaker- maybe be more specific in your recipe- either FRESHLY grated parm or shredded parm. You can use either really. People are just being picky thinking theres a difference in taste between freshly grated parmesan and crumbled parmesan. Really freshness doesnt change much flavor when it comes to most foods. I can guarantee if I served you alfredo sauce made from crumbled parmesan in a shaker can you wouldnt even know. We’ll have to disagree on that one, Jake. Freshness plays a huge role in the flavor of most food and Alfredo sauce made from powdered Parmesan absolutely tastes like it was made from powdered Parmesan. 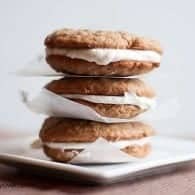 I add a tbsp of cornstarch to the melted butter and 1/2 block of cream cheese too. I made this tonight and it’s way to salty for my taste. If I made it again I would cut the salt and than salt to taste at the table. Sorry to hear it was too salty for you. I didn’t realize that I wasn’t to use parmesan cheese that comes in a green shaker until I read it too late in the comments section. The sauce turned out pretty terrible. The cheese overpowered the sauce and it was really inedible. Oh, yikes, I bet that was pretty gross. The powdered Parmesan is really only to be used as a topping. It doesn’t work the same as grated cheese and won’t make a great sauce. Try using less. 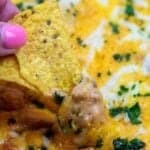 Id say half the amount of cheese would make it taste right but really its better to add it in small batches. Maaybe start out with 1/2 cup of crumbled cheese taste and add 1/4th of a cup at a time until you reach the desired taste. I’m so glad it turned out for you in the end! I’m not sure what would have went wrong with the grated cheese either. Strange! 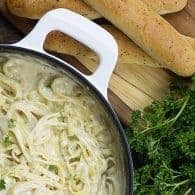 This is one of the best Alfredo sauce recipes I have come across. 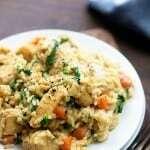 It is super easy to make and the flavor payoff is amazing for such limited ingredients. My only complaint is that this sauce cannot be reheated. The butter ends up separating from the cheese. However, if someone knows how to reheat it without it separating I would love to know because I definitely want to be able to enjoy this sauce a second time. I was so impressed with how simple this recipe seemed! And a little skeptical. This did not go well. If I were to make it again, I would make a roux at first to thicken it, and then not add so much cheese! It was extremely salty and watery and clumpy. Not recommended. delicious! mixed in some cooked peppered chicken and penne. the whole family loved it. I did not, however, add any if the salt, as parmesean is already salty, in my opinion. I used the Kroger brand bag of shredded parm. I will make this again! What kind of heavy cream?? Just made this tonight and served over angel hair pasta with shrimp. Absolutely delicious!! 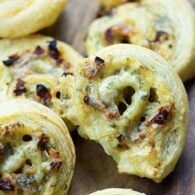 Have already shared the recipe and will definitely be making again! Thanks for such and easy, scrumptiousalfredo sauce recipe! I made this tonight! Thanks! It was delicious and easy to make for a quick dinner!!! Thanks for posting! Should read, “to a sauce pan”. Salted or unsalted butter? Thanks! An earlier post mentioned that The Olive Garden uses flour in its alfredo sauce. 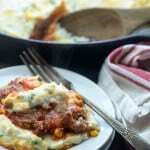 If so, how does this recipe compare in consistency (thickness) and flavor ? I really want a sauce that is identical to Olive Garden’s. Thanks in advance for your help. 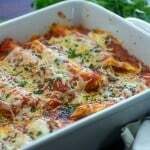 I used this recipe except I used milk instead of heavy cream to make the sauce twice. Both times the sauce was gritty. Could milk have caused this? Try grating your cheese yourself and cooking until it’s fully melted. Milk likely wouldn’t make it gritty, but I also don’t think that Alfredo sauce is something you can use milk for. The heavy cream is key. This sauce is AMAZING! I also added some chopped and sauteed Bella mushrooms then poured over grilled chicken breast. This made a my wife very happy. Thank you so much for this. The sauce was smooth and delicious and when I added it to saute vegetables ( red pepper and onion, it went lumpy and stringy. I added the linguine too this and stirred well and a large piece of parmesan cheese came out on the fork. What did I do wrong? Hmm, I’m really not sure! Are you sure all of the cheese was melted before you added it to your vegetables? 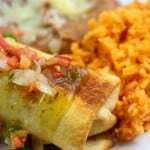 I made this for dinner tonight and hubby says it is far better than Olive Garden. I made only one adaption…. I used 1 cup Parmesan, 3/4 cup Asiago and 1/4 cup mild Cheddar. I served it over crab/lobster ravioli. Hubby says to thank you for the recipe….. I thank you also. must. have. the. recipe. for. the. bread. sticks. 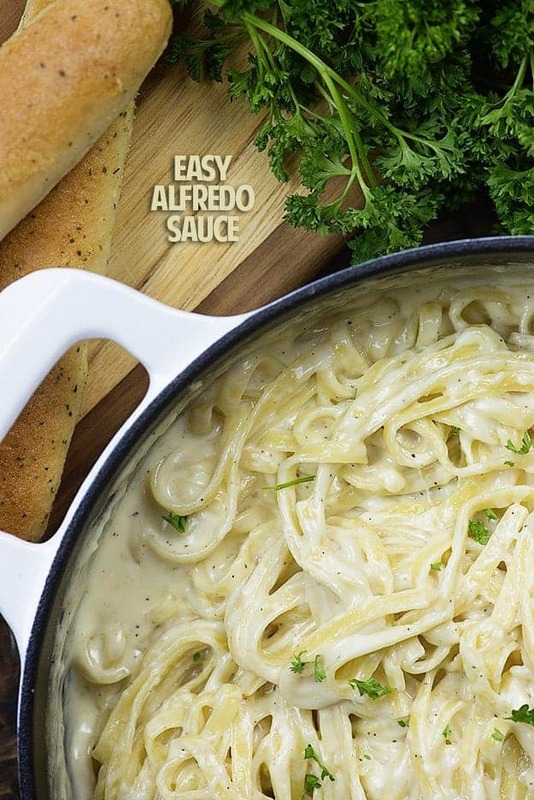 going to try this alfredo tonight, looks sooooo yummy!!! Sorry, but you can’t be too lazy to make a roux. 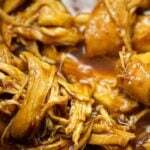 It is better when reheating, but you have to reheat slowly, stirring often, without breaking the sauce. Also, If you’re going to claim better than olive garden and then omit milk and romano cheese as well as the flour, well that’s just false advertising. I’m not being lazy at all. I’m making alfredo the traditional way, which I believe is better than Olive Garden’s. Cannot wait to try tonight! 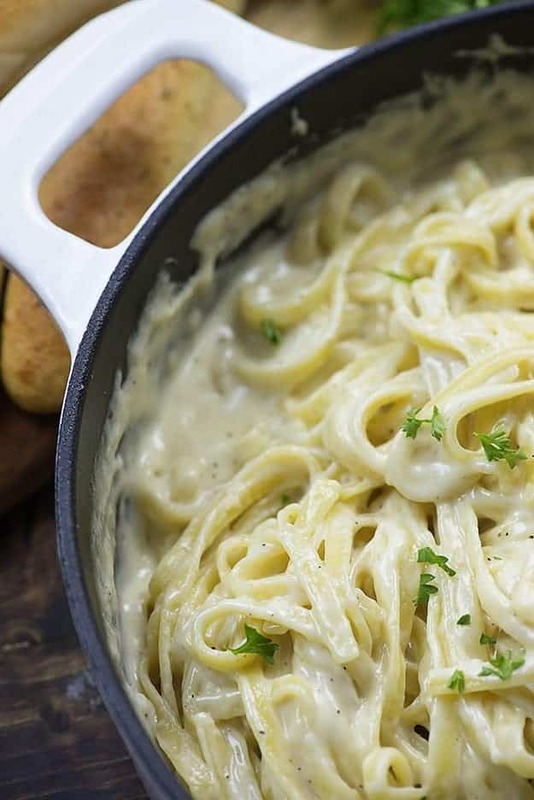 This Alfredo is so easy to make and it is amazingly delicious. I haven’t tried this with other cheese subs but I think it’d work fine! Flavor won’t be quite the same but the sauce should still come out smooth and creamy. The flavor is amazing! I added italian seasoning. The sauce breaks though, i didnt want to add any flour. Ill try it again, great flavors, thanks. Why can’t it be Hispanic pepper instead of black or white pepper? Hmmmmmmm???? That so so amazing! Thanks for your recipe. This was delicious!! It was a wee bit salty so I added extra cream…anf it solved the problem. I used Aldi grated Parmesan and I am sure if I grated my own it would have been even better! This sauce makes me craving. I’m thinking many combinations with it. Can I put 2 and a half cup of parmesan? Or 1 cup of parmesan with 1 of cheddar? This was absolutely delicious, made it last night and it was a hit with everyone at the table. Whatever was leftover was later mopped up with bread sticks. My husband even loved it and he hates Alfredo sauces. Made some tweaks to this but not because it wasn’t great, I just prefer a garlicky/ earthy tasting sauce so I added teaspoon and a half more garlic and sauteed the garlic with some finely diced onion and added a pinch of nutmeg to the cream which I used a extra 4oz. because my husband’s dislike for anything sauce that’s to thick . Once it was finished I stirred in a tablespoon of chopped parsley. Sounds delicious! Glad it was a hit. This looks wonderful, just wondering what is the serving? Nutrition info is based on this serving 8. I made this and topped it with seared sea scallops and royal red shrimp. Your sauce recipe is awesome. The flavor with the garlic is perfect. This recipe is definitely a keeper! Thanks! The adding of cream to Alfredo Sauce is an American invention. In Italy cream is not introduced into sauce . A good cheese and pasta water is the way to go. By the way I am not Italian. 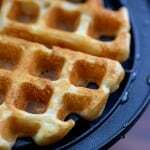 Any chance you have you ever tried using 1/2 and 1/2 instead of heavy whipping cream? I happen to have that on hand and wondered if it could be used as a substitute. Probably would be just a bit thinner.